The African Union has suspended Guinea after last week's military coup in the West African nation. Guinea would remain suspended "until the return of constitutional order in that country," the 53-member bloc said in a statement from its Ethiopian base. Junta leader Captain Moussa Dadis Camara seized power after the death of long-serving President Lansana Conte, attracting international condemnation. But many Guineans back the army's move after many years of misrule. Guinea's temporary exclusion from the AU was decided on Monday during a meeting of the body's Peace and Security Council in Addis Ababa, where the organisation is based. 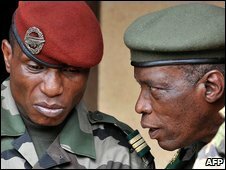 But the African Union decided not to apply sanctions and said it would work closely with the coup plotters, to try to bring Guinea back to constitutionality. The BBC's Elizabeth Blunt in Addis Ababa says although it still counts several former coup plotters within its own ranks, the African Union's rules state quite plainly that governments which take power by unconstitutional means will be suspended from the organisation. The temporary exclusion would stand even if the people of Guinea were welcoming the takeover, the African Union said. Before the meeting, an AU official told AFP news agency that suspending Guinea was the organisation's only option. "Coups will only exacerbate the continent's existing problems and there is no time to tolerate such actions," said the official, who did not want to be named. But the Economic Community Of West African States said on Monday it believed the coup could present an opportunity for democracy in Guinea. Ecowas executive president Mohammed Ibn Chambas, who has just met coup leaders in Guinea's capital Conakry, told the BBC he was surprised by the support among political parties, civilians and trade unions for the coup. "I think it's born more out of frustration and disappointment from the previous government who did everything to frustrate the building of a democratic culture in that country," he told the Network Africa programme. "However, I think the opportunity is there now to have a break from the past and to put the country on the path of democratic growth." President Conte died aged 74 on 22 December, after being in power for 24 years - he had staged his own coup in 1984. Hours later Capt Camara took to the airwaves to announce the dissolution of the government, pledging to root out corruption. 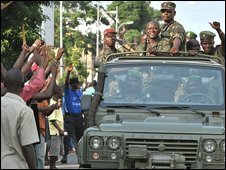 The ousted government initially opposed the coup but, with sentiment on the streets favouring the takeover, soon pledged loyalty to Capt Camara. By Friday nearly all political parties and unions were on board. The junta has so far ignored calls to relinquish power. It promises to hold elections by the end of 2010. The coup was condemned internationally but Senegalese President Abdoulaye Wade has urged the world community to recognise the new leadership. On Sunday the coup leaders sacked more than 20 generals, a move correspondents said was designed to consolidate their grip. At the weekend, Guinea's junta also announced it was suspending mining operations in the country pending a "renegotiation" of agreements with mining companies. More than a third of the world's bauxite reserves are in Guinea, making it the second-largest producer internationally. It also has large reserves of gold, diamonds, iron and nickel. Should world talk to Guinea?